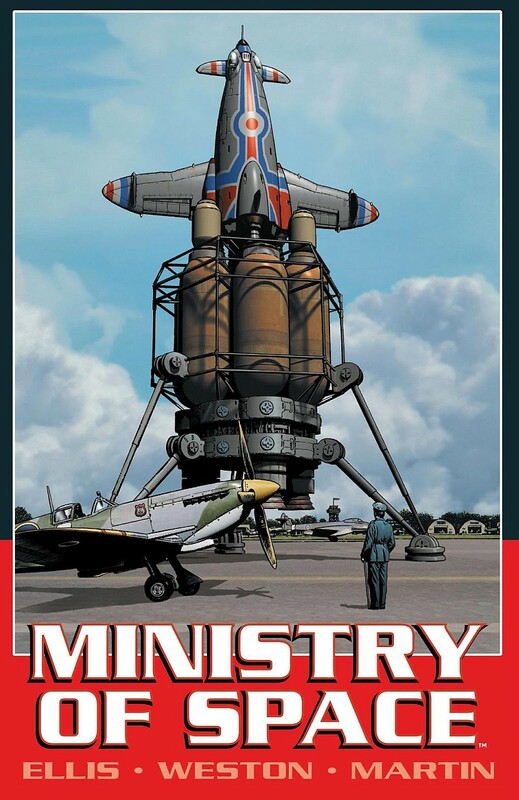 I’ve always had a soft spot for tales of alternative courses of history, and Ministry of Space has been on my To Read-list for years. 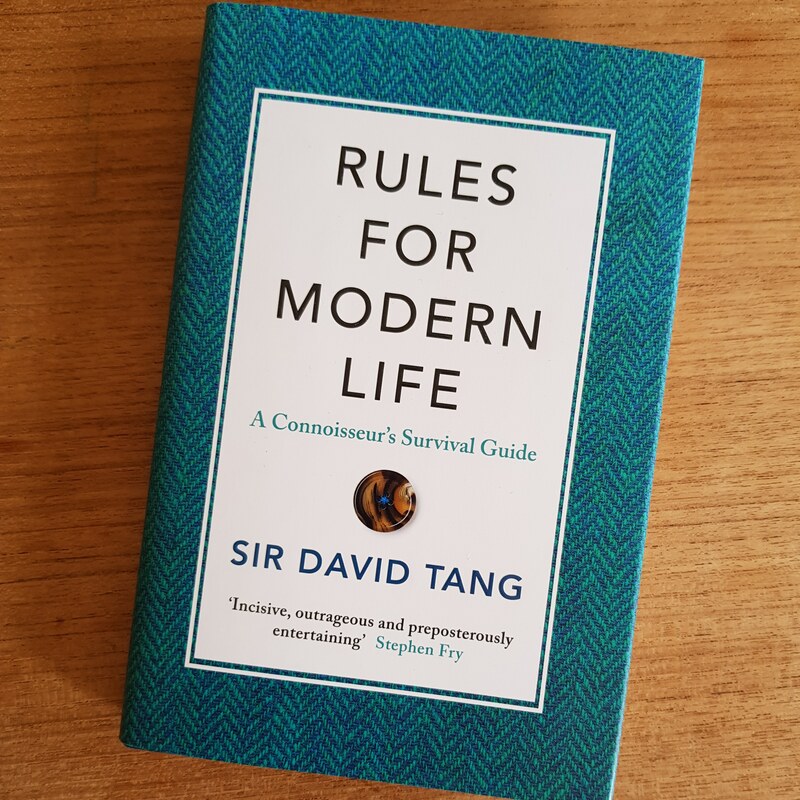 Dealing in elements of World War II, the British empire, science fiction, and space travel, plus being written by Warren Ellis to boot, this book ticks off too many of my boxes to ignore. The collected edition being back in print, finally made it possible for me to get my hands on it. Ministry of Space starts off at the conclusion of the second world war. Britain manages to capture the top German rocket scientists and set them to work on their newly created space programme. Backed by a massive black budget, the programme makes constant leaps in technology, effectively making Britain the only power to truly enter the space age. 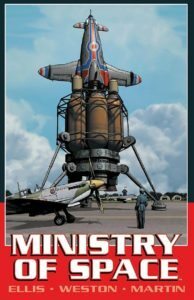 As a sci-fi short story, Ministry of Space works well. All the elements of a good sci-fi story are there – heroism, futuristic technology, ventures into the unknown, new frontiers – but I can’t help but feel that this story could and should be much more. I understand that a longer story would’ve greatly increased the work effort, especially if turned into a comic. But I think there’s plenty of stuff and possible story lines in there for an entire novel, or indeed an arch of novels. Not to sound disrespectful, but I think the idea is too good and contains too many aspects for a mere, lonesome comic book. Ellis chooses to focus on the British space programme alone, while I would’ve loved to see the story greatly expanded. What about world politics? Economy? Or what about other space programmes? The American space programme being the only other briefly mentioned. In this version of history there is no real space race, but surely the US and USSR wouldn’t have let the UK dominate space like this? And if they would, and did, at least explain why! And what about throwing China or Japan into the mix? In the end, the only source of tension in the story is the question of where the money in the black budget came from. This would’ve worked great as one of many story lines in a greater context, but as it stands, the build up and conclusion simply isn’t strong enough. Ministry of Space is a great idea, but doesn’t feel like a finished product. 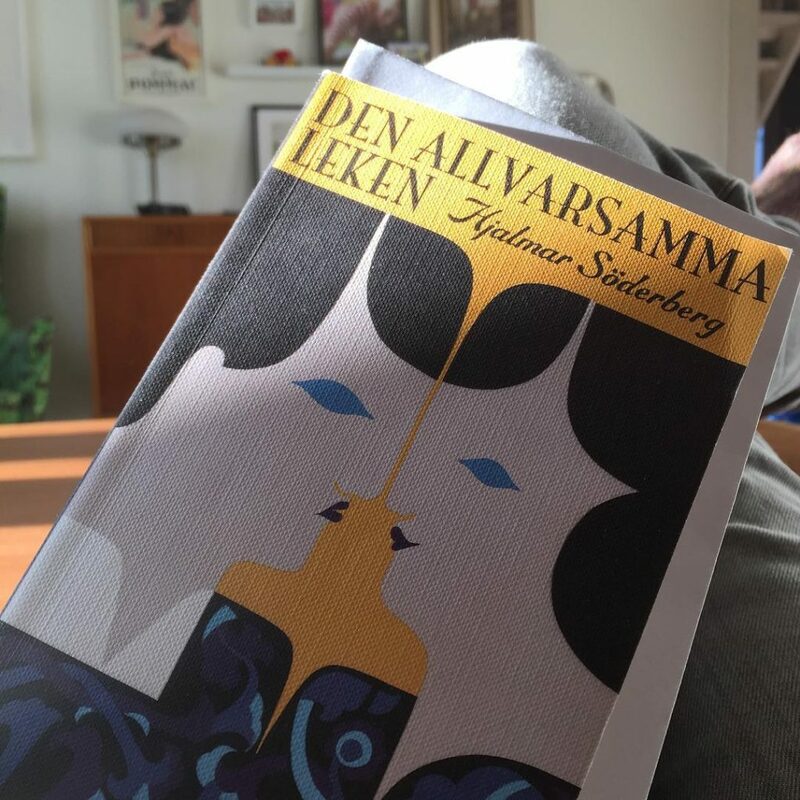 After watching a segment on Tao Lin on Babel, the excellent Swedish TV-show on literature, I put him down on my To Read-list. I picked up a copy of Shoplifting from American Apparel (Swedish title: Sno kläder på American Apparel) from the library. The book portraits the tech oriented fellowship of young people very well, and it oozes of the awkwardness that youth without a sense of social direction tend to exude. Something I can identify with quite easily, as this was pretty much my own life from my late teens to mid twenties. But that’s all this book has got going for it. The writing is very rigid and to the point, which isn’t necessarily a bad thing, but Lin turns into a mere pile of events. Highly uninteresting events. My main problem with the book is that nothing happens. There’s no story. The only interesting bit is when the main character is caught shoplifting and has to spend a day in jail. The rest of the book is just nothing. When reading, I felt like I was being played a joke by the author. Like he’s experimenting with how badly and awkwardly he can write and still maintain an audience. 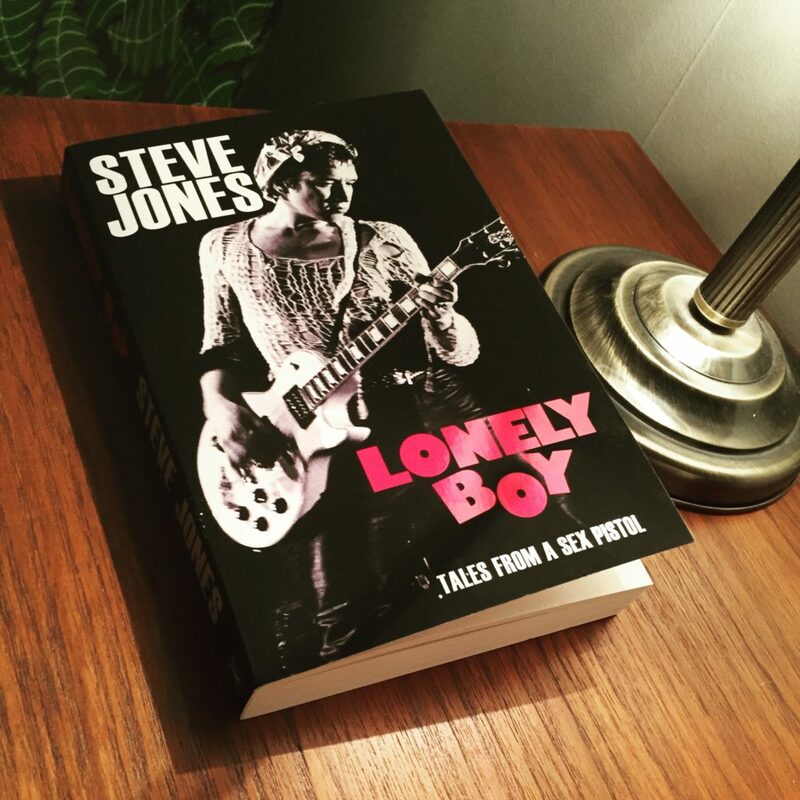 To see how much name dropping and vegan smoothies he can get into a hundred pages without getting called on it. As if he’s attempting irony, but failing, on purpose, ironically. Perhaps this book isn’t representative of his work in general, and the translation didn’t do it any favours. But truth be told, I think this was enough Tao Lin for me.